This story is featured in the upcoming Fall 2018 edition of the HPU Magazine. Discover below how HPU’s Nido R. Qubein School of Communication prepares students for the real world. Courtney Leopold sat in a room with the producers of Fox News. She was interviewing for a production assistant position she’d been chasing. One of the interviewers cut to the chase with that question. Leopold broke into a smile. 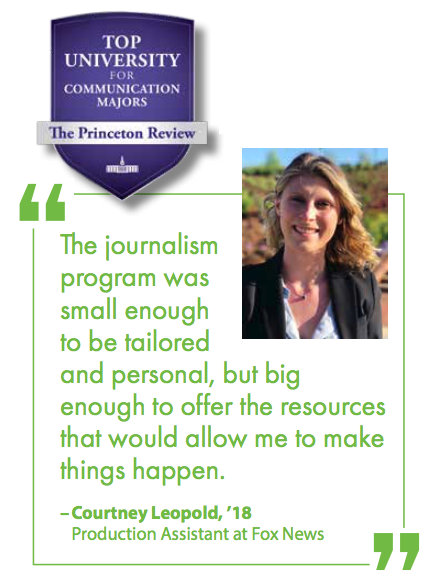 If there’s one thing HPU’s Nido R. Qubein School of Communication had given her, it was a well-built portfolio — one that rivals and reflects the experience that takes industry professionals years to acquire. And that long list of experience began her freshman year. It was 2014. The setting was Dr. BobbyHayes’ office. Leopold came to HPU from New Canaan, Connecticut. “The journalism program was small enough to be tailored and personal, but big enough to offer the resources that would allow me to make things happen,” says Leopold. Hayes, assistant professor of communication, remembers the day Leopold first asked him for guidance. She came in seeking more ways to build her resume. He told her about the school’s Society of Professional Journalists (SPJ) chapter. 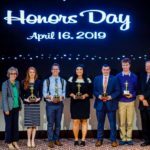 He emphasized the opportunities to network with other aspiring journalists and told her about national conferences that the group attends each year. She was sold. 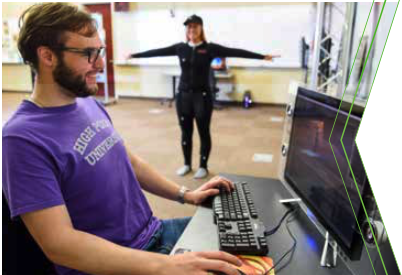 Game and interactive media design students utilize the School of Communication’s state-of-the-art video game technology such as motion capture equipment that transfers real human movement into a digital character. In the years that followed, Hayes helped Leopold land internships with NBC Sports covering the 2016 Rio Olympics, NBC Sports in Boston the following year, and Raycom Sports after that. She was in the final round of interviews with ESPN when Fox News made her the job offer. Just days after crossing the stage at Commencement, Leopold headed to Sixth Avenue in New York City to begin her role with Fox News. And she credits Hayes with her success. To do the interview with Fox News, Leopold had to reschedule a final exam with Hayes. She felt bad about making the special request, but Hayes just laughed. That’s what Leopold loves about HPU’s School of Communication. Her mentors were always there showing her what she was capable of. 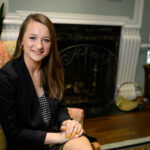 Hayes remembers life at HPU before the School of Communication. One small suite in the English department — that’s where the communication track was housed. Hayes was one of three professors who taught journalism. When HPU President Nido Qubein took the helm in 2005, he came with the intent of taking the institution to a higher level. The one thing he felt HPU needed upfront was the discipline of communication. 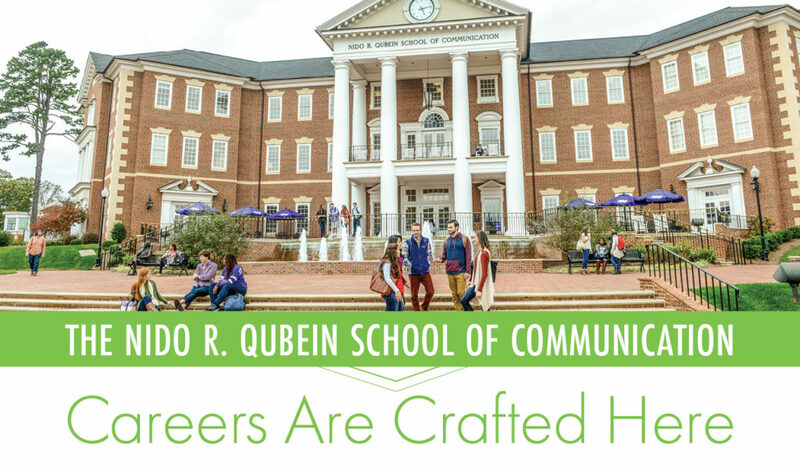 Qubein knew that if the university built a School of Communication, students would thrive there. Ten years ago, the school opened its doors and became the first new academic school added under Qubein’s leadership. Today, the School of Communication has grown into a community of 800 scholars and producers in eight different disciplines. 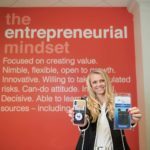 “I knew that once it started, it was going to grow quickly and branch out into several fields of communication,” Hayes says. Hayes teaches courses in feature writing, copy editing, sports reporting and a course in the B.A. to M.A. fifth-year strategic communication program. Downstairs from his office, you can find Dr. Stefan Hall, co-chair of the communication department, inside his classroom — a state-of-the-art game design lab. From there, you can also peek inside a completely revamped TV studio that serves as home to student producers, news anchors and talk show hosts. The school is versatile, catering to an array of interests. And the best part? The school is ever-evolving. And it’s not just the curriculum that’s evolved; it’s also the physical environment. Like the TV studio. It received a $1 million makeover last year that included new 4K camera equipment, lighting and switchboards. Students like senior Mitch Rissmiller are appreciative of the updates. As a freshman, Rissmiller worked as an anchor for HPU’s Triad News but found he didn’t pair well with hard news. He wanted to do more lifestyle and entertainment reporting. So, as a sophomore, he approached Michaels. Michaels knows a thing or two about talk shows. He’s a 44-year veteran of NBC who has won eight Emmy awards, and for more than two decades, directed the “TODAY” show. Today, he’s HPU’s Broadcaster in Residence, teaching students the art of TV production. Rissmiller dropped by Michaels’ office and asked about producing a campus talk show. He made his pitch, Michaels listened, and right away, he knew. He helped Rissmiller create “Let’s Talk,” and in doing so, Michaels discovered a student who possessed the skills needed to program, lead people, put a show together and interview well on camera. The next summer, Michaels ran the pool feed for major news networks at the Democratic National Convention in Philadelphia, and he knew he could bring in student interns to help. He knew who to approach. Rissmiller jumped at the chance. Michaels watched what Rissmiller did in Philadelphia and with “Let’s Talk.” And Michaels was there when Rissmiller asked for advice about how many internships he should apply to his sophomore year. Michaels told Rissmiller to go after as many as he could. Since then, Rissmiller has interned for Madison Square Garden, assisting with marketing and digital strategy for MSG brands like The Rockettes. He’s worked as a digital marketing intern with Warner Bros. Pictures and as a production assistant on “Watch What Happens Live with Andy Cohen” in Los Angeles. This past summer, leading up to the start of his senior year at HPU, he served as a production intern with NBC’s “TODAY” Show. HPU faculty like Michaels keep Rissmiller motivated. “The internships I’ve gotten and the people I’ve met are because of my professors,” Rissmiller says. “That’s a hallmark of HPU, and they do it insanely well. You’re around talented people willing to help, and you don’t feel like a number. They know you.